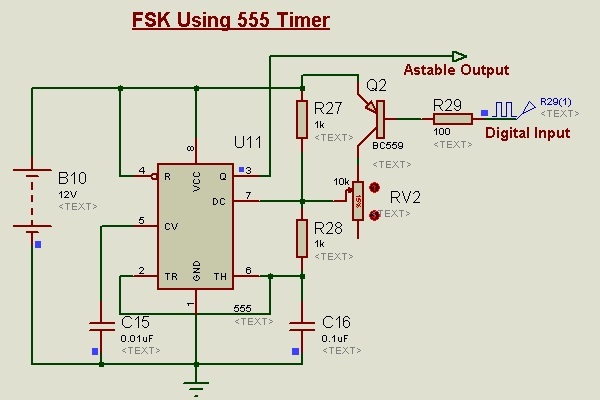 555-Timer is one of the most popular and mostly used ICs. It best suits for timing/timekeeping related circuits. It consists of two operational amplifiers operated in an open loop or comparator mode, RS Latch with additional Reset input, a discharge transistor, an inverting buffer and an amplifier in the output stage. It has a voltage divider circuit with three 5K Ohm resistors in series. 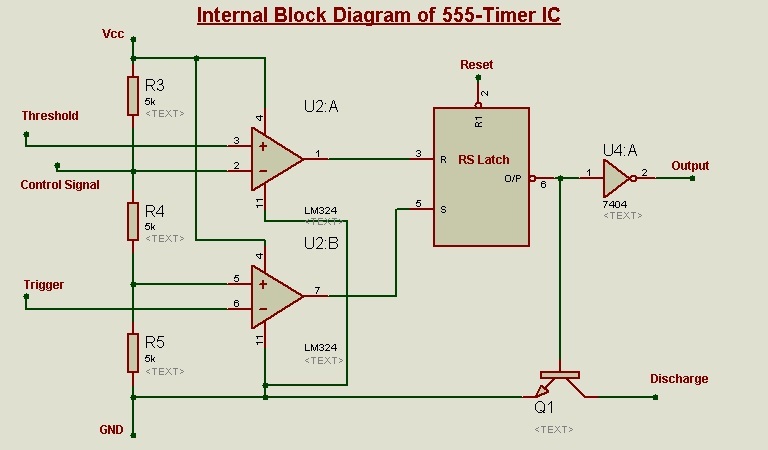 556 is a dual timer IC. The internal block diagram of 555 is as follows. The Upper comparator-UC is a Non-Inverting comparator, compares the input signal with 2/3Vcc and Lower comparator-LC is an Inverting comparator, compares input with 1/3 Vcc. The output of UC is given as R input of RS Latch and output of LC is given as S input of RS Latch. The RS Latch has an external Reset input which provides the option to reset the output instantaneously. The inverted output of Latch turns ON/OFF the discharge transistor. Inverting Buffer in the output stage inverts the output of Latch and drives the load. The RS Latch in the 555 Timer can be used with the Reset and Trigger inputs. The output is set or reset with the momentary inputs applied at these inputs. As the S and R inputs are controlled by the outputs of the Op-Amps with trigger and threshold inputs; under the normally open state of the switches the outputs of Op-Amp are such that R, S inputs are 0,0 i.e., LOW state for which, the output of the RS Latch remains in the previous state. The above circuit is a Bi-Stable latch using Trigger and Threshold inputs of 555 Timer. 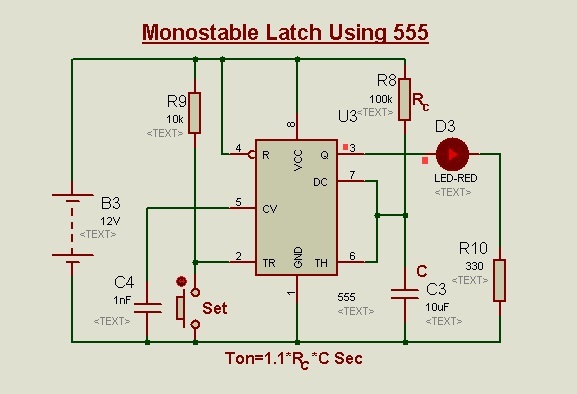 The output of UC (Upper Comparator) which is Reset input to RS Latch is High when the Threshold input is High or Greater than 2/3 Vcc, so it is Pulled Down. When the Reset input is high with Low Set input to the latch, the output is Reset i.e., Low. 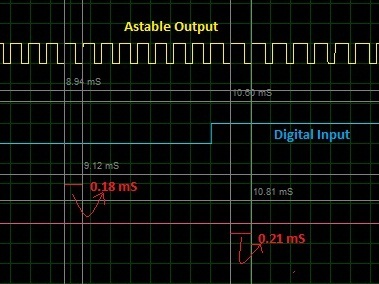 The output of LC(Lower Comparator) which is Set input to RS Latch is High when the Trigger input is Low or Lesser than 1/3 Vcc, so it is Pulled High. When the Set input is high with Low Reset input, the output is set, i.e., High. 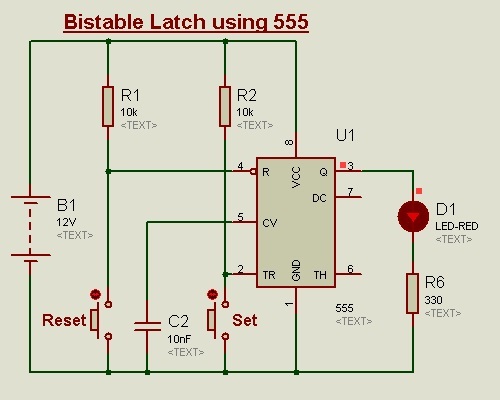 The above circuit is a Bi-Stable latch using Trigger and Reset inputs of 555 Timer. The Threshold input is left open or can be Pulled Down. Irrespective of the Trigger input, When the Reset input is Low, the output is Reset i.e., Low, and so Reset pin is Pulled Up. The output of LC(Lower Comparator) which is the Set input to RS Latch is High when the Trigger input is Low or Lesser than 1/3 Vcc, so it is Pulled Up. Using the charging and discharging phases of RC-Circuit as a continuous voltage signal, timing circuits can be designed. When the voltage at trigger input falls from Vcc to below 1/3 Vcc the LC (Lower Comparator) sets and this, in turn, sets the RS-Latch and hence, the output is set. The voltage across the capacitor is connected to the Non-Inverting terminal of the UC (Upper Comparator) and is compared with pre-set 2/3 Vcc at the inverting terminal of the Op-Amp. When the capacitor voltage tends to exceed 2/3 Vcc, the UC sets and this, in turn, resets the RS-Latch and hence, the output is reset. Thus, the output is set during the charging time of capacitor from 1/3 Vcc to 2/3 Vcc. 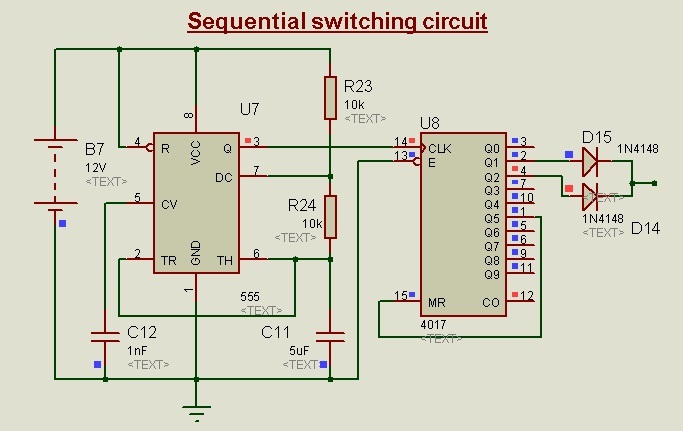 This circuit is used to generate time delay circuits like Time delay relay, one-shot operation of the load in sensor based load switching like PIR sensors etc. The monostable circuit is modified to re-trigger itself by connecting trigger terminal and threshold terminal. As in the monostable circuit, the output is set during the charging period of a capacitor. 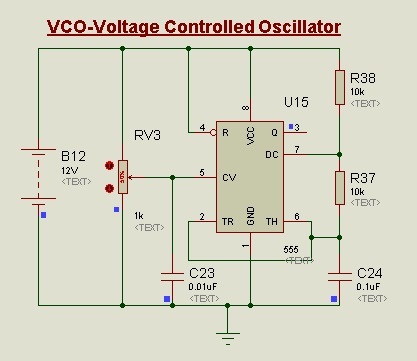 When the voltage across capacitor tends to exceed 2/3 Vcc, the output is reset. The capacitor discharges through Rb. As the voltage tends to fall below 1/3 Vcc the timer is triggered again itself. Thus, the output is reset during the discharging period of the capacitor. However, the Set and Reset time durations will not be equal to this circuit. The resistors Ra and Rb are involved in charging the capacitor but, only resistor Rb is involved in discharging period. So, charging time will definitely be more than discharging time i.e.., TON is more than TOFF. 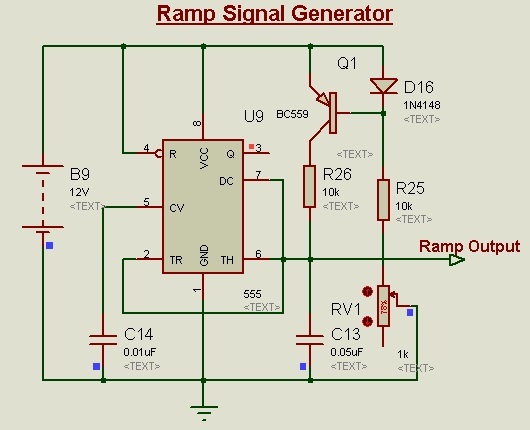 Hence, this circuit can be used to generate clock pulses for digital circuits or where the frequency is the parameter rather than the duty ratio. This is called Square wave generator, which can be used to generate musical notes by setting the frequency of wave at desired musical note. For example, setting the frequency at 440 Hz and connecting speaker at the output in proper configuration gives musical note â€˜Aâ€™ of musical piano. This note is used as tuning standard. With the basic astable circuit, the duty ratio cannot be controlled without affecting the frequency. Using the above circuit, it is possible to maintain a constant frequency with variable duty cycle. The TON and TOFF durations are individually controlled by placing the bypass diodes. As the Pot type variable resistor is used, the frequency is maintained constant because the total resistance Ra + Rb is constant even if individual portions are varied. By including a variable resistor in series with the capacitor in the above circuit, frequency can be varied along with the duty ratio. As this resistor is involved in both charging and discharging periods, this does not affect the duty ratio. This circuit can be used for speed control of motors, brightness control of lights etc., even if the specific frequency for proper operation is not known as in the case of dc fans or dc motors. It can be set by trial and error. The minimum time period of the waveform depends on the duty cycle potentiometer and maximum time period depends on the frequency potentiometer. Variable resistors should not be in their extreme positions or use fixed resistors in addition to a potentiometer to avoid this. 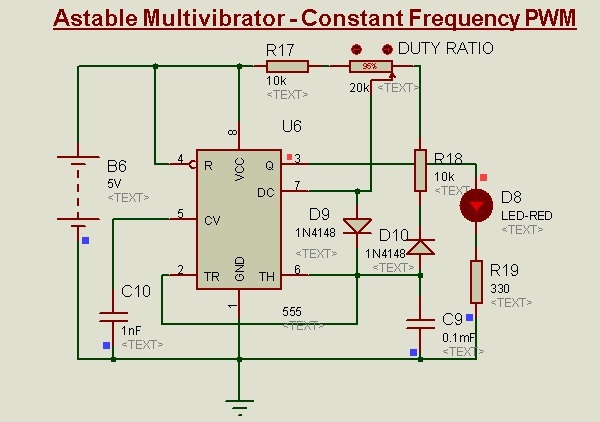 The astable multivibrator can be used as a clock pulse generator for digital ICs like counters. CD 4017 is a decade counter, so ten events can be run in sequence with this IC. 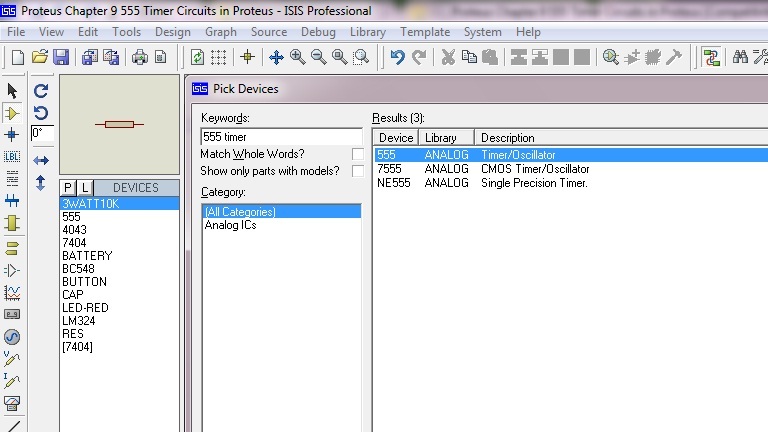 Clock pulse can be applied to the astable multivibrator with constant or variable frequency option as required. 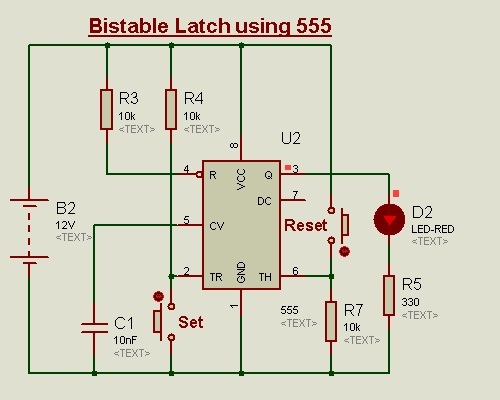 The duration of the desired stage can be increased in steps by using diodes as shown in circuit diagram. This is generally used for running lights. By using variable frequency circuit, the speed of running effect can be varied. A number of stages can be varied by connecting the next stage of desired last stage to the MR (Master Reset) pin. The Control Voltage terminal of the IC is internally preset at 2/3 Vcc. When the timer is operating in astable mode, if this voltage is altered externally through a potentiometer, the pre-set voltage levels with which the comparators compare the voltage at capacitor will change. This causes the shifting of Set and Reset instants of the timer. As the control voltage increases, the time period of oscillation increases and vice versa. 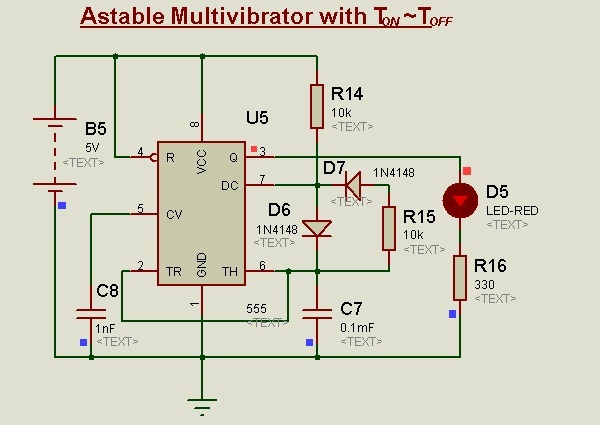 The astable multivibrator with discharge terminal connected to the threshold terminal offers the least resistance during discharge period of the capacitor. This gives a sharp negative edge during the discharge period. A transistor is included in the charging path of the capacitor. As the capacitor voltage increases, because of the parallel path through resistors at the base of the transistor, the capacitor charges almost in a linear fashion. 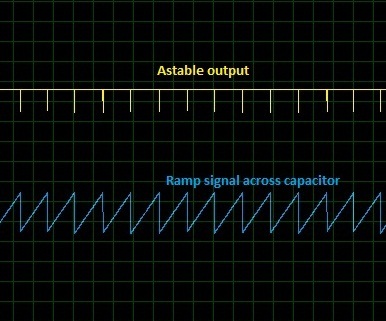 Thus linear ramp signal is generated across the timing capacitor. 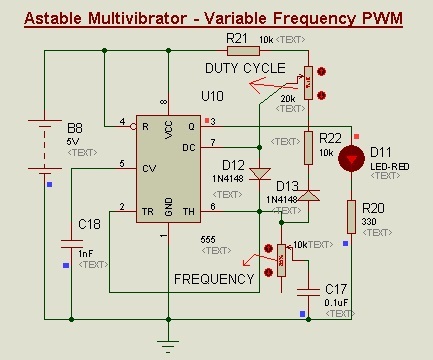 The astable multivibrator with selective frequency input gives FSK Frequency Shift Keying. We may manually change the frequency through a potentiometer, but if it has to be changed by a digital signal, this circuit can be used. By inserting a resistance in parallel to the existing timing resistors, the time period can be varied. This is done with the help of a transistor. This is not limited to a single parallel path, we can increase as many parallel resistors as required, provided there are enough inputs. The monostable multivibrator, with the modulating signal at the control voltage terminal, gives pulse width modulation according to the modulating signal. For this, the basic requirement is, pulse duration of mono-stable circuit should be far less than the time period of the modulating signal. 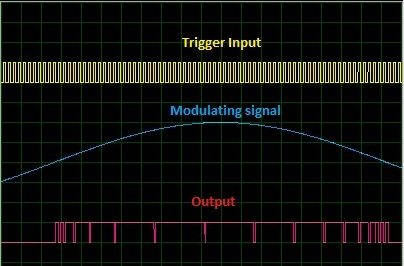 The frequency of the Trigger input should be far higher than the modulating signal. This type of circuit is generally used in inverter design. 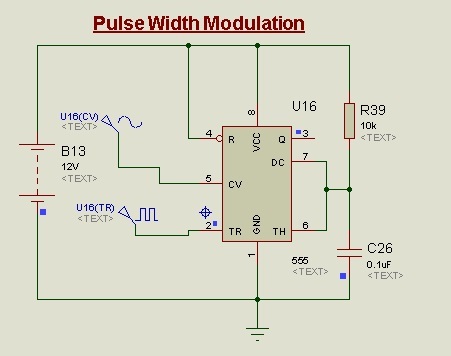 Trigger input of about 20 KHz is used and the modulating signal will be sinusoidal at this power frequency. This is just a basic idea, but actual frequencies are obtained by lots of calculations to reduce harmonics and to produce the desired magnitude of voltage. Thank you for having a site like this.